The museum was opened to mark this year’s 150th anniversary of the restaurant, which now has about 100 branches worldwide. Covering an area of 1,000m2, Quanjude Roast Duck Museum is ensconced in the Hepingmen Branch on the seventh floor. Such expensive land parcel embodies the brand's dignity and boldness. Roast duck — or Peking Duck, as it's often known — has been served in Beijing for around 600 years, according to Liu. First served by palace chefs during the Ming dynasty, it has royal pedigree. At the gate set up a golden duck sculpture and other sculptures displaying a series of duck’s roasting processes. Peking duck is prepared from the fatty Peking duck. Before being put into in an oven for roast, the duck shall be filled with air and glazed with a layer of maltose syrup while it is hung for 24 hours. Such processes can make the dish shiny brown and give guests an appetite. Then, it is roasted in a closed oven with the temperature inside up to 200 °C. The oven is usually heated by burning peach wood. Traditionally, the meat is eaten with spring onion and sweet bean sauce with pancakes rolled around the fillings. The museum displays coupons for duck dating back to the Qing Dynasty, posters made in the Republic of China, and old photos of Mao Zedong (the founding father of the People’s Republic of China) and Zhou Enlai (the first Premier of the People’s Republic of China) among other Chinese leaders enjoying Quanjude Peking Roast Duck. 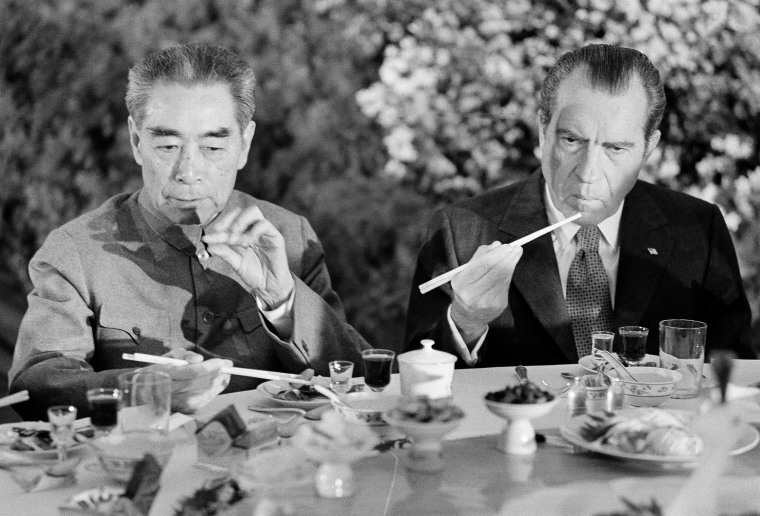 In 1972, Zhou Enlai invited Richard Milhous Nixon, the former President of the United States, to enjoy Quanjude Peking Roast Duck at the feast held in Great Hall of the People during Nixon’s visit to China. Such significant historical events have been accompanying Quanjude’s development all the time. On the walls are pictures of Chinese leaders scoffing roast duck, including Mao Zedong, Zhou Enlai and Deng Xiaoping. There is also a photograph of President Richard Nixon during his ground-breaking 1972 visit to Beijing and an ailing Kim Jong Il, the late North Korean dictator.